Infosys's Q4 and FY15 numbers disappointed the Street on many counts. While you have missed the revenue forecast for FY15, your forecast for FY16 of 6.2-8.2 per cent growth (in dollar terms) is lower than the sector's estimated growth of 12-14 per cent, as given by Nasscom. That means you are not hoping to get back to sector growth next year as well? Bansal: The impact of cross-currencies during the year is about 380 basis points and that is very significant. While Nasscom has given its number, does anybody have clarity whether that is a cross-currency number or it's a reported number, or what is the basis behind it? They didn't ask for the number. So we don't know the basis on which Nasscom is giving the number and what does that number mean. But a 11 per cent (taking 11 as a mid-point of 10-12 per cent) is very significant from the point of view of this year's growth when we grew at 5.6 per cent. It's almost doubling our growth in terms of forecast. We are still to see three years to get the sector growth, which is FY17. If you look at it from a journey perspective, from 5.6 per cent to the sector growth rate, the next year's forecast is very good. Sikka: That is an important point. We are not currency speculators; we are leaders of a software and services company. Constant cash is all we have visibility to and we are broadcasting, given the forecast of minimum of 10 per cent constant currency growth. While the attrition rate has declined compared to the previous quarter on the last twelve-month (LTM) basis, it still continues to be high at 18.9 per cent. What are the reasons for your satisfaction from the attrition point of view? Sikka: In terms of attrition, I completely disagree with your characterisation; the attrition has come down dramatically. In the month before I took charge, we lost some 2,500 people. In January this year, it came down to around 1,700, and in February to 1,400. In March, the number came down to 1,350. So, the number has come down by more than half in the course of eight-nine months. There has been a dramatic decrease in attrition and we are ahead of the sector. Bansal: The attrition on an LTM basis includes the number of people we lost during the last four quarters. But based on the attrition figure in the quarter under review and the annualised number, it is 13.4 per cent. It is more relevant for us to take a decision based on annualised attrition than LTM attrition. The company seems under some pressure in the near term. The long-term aspiration you have detailed is to become a $20-billion revenue company by 2020. Is there any structural challenge in the near term? Sikka: In terms of the near term, we are absolutely focused on that. Our entire leadership team is focused on ensuring the operational efficiency, the sales and the organisation's effectiveness. We are all focused on delivering results on a quarterly basis. While we are keeping our eyes on the future, we do need a guide-force to think about where are we headed in the future, over a longer term, so that we don't get consumed by the decision-making that has to be done in the short term only. That's the reason why we have set a bar for a longer term, while we will continue to be focused and measured by quarterly performances. 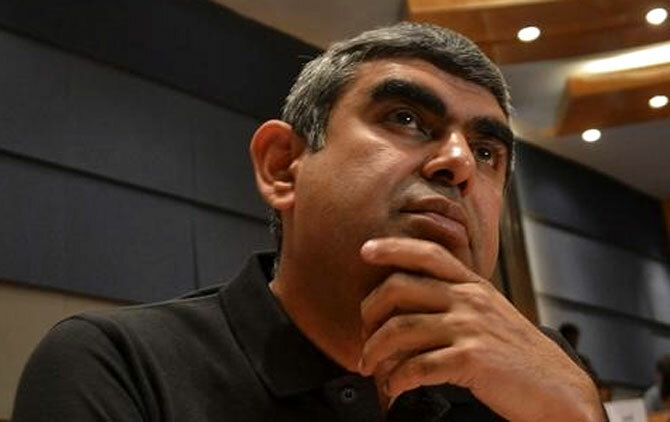 Why is Infosys holding its board meeting in Chennai, for the first time outside Karnataka? Are you planning to do it in other cities as well? Sikka: One of our board members was in Chennai for his family function, so we thought it would be better that everybody is in Chennai, and we have such an awesome campus here. We can hold board meetings or news events at any one of our facilities in other cities.